For those individuals who feel the 'base' G63 AMG 6x6 is not powerful enough, here's another tuned version from Mansory with a whopping 840 horsepower. What did you say about polar bears? 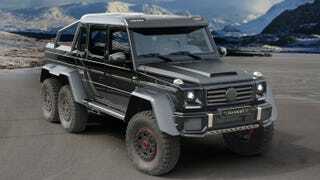 While we don't know the exact price of Dartz's latest Die Hard offering, the Brabus B63S-700 costs $755,000. For that, you get 700 horsepower, 708 pound feet of torque, a luxurious interior and a beefed up suspension. With side pipes. Mansory clearly had to top that somehow, and they started under the hood with new main bearings, connecting rods, crankshaft, cylinder heads and other bits here and there to get 840 horses and a peak torque of 738 lb-ft, which had to be electronically limited as usual with tuned AMGs. Mansory also gave the biggest Mercedes new LED headlamps and a bunch of carbon fiber components such as the front and rear skirts, the mirror housings and the engine ventilators. Inside, they put more wood and Alcantara.